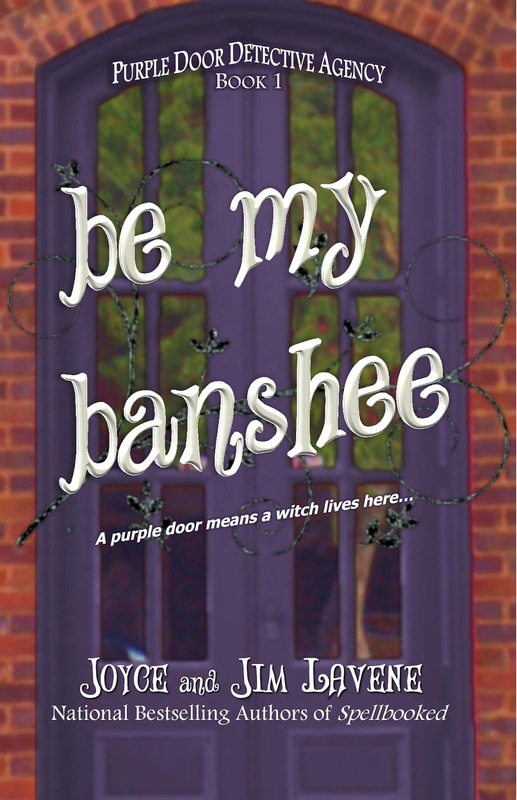 Killer Characters: It's Good to be a Witch at the Purple Door Detective Agency! It's Good to be a Witch at the Purple Door Detective Agency! Honestly, I don’t know why people are so negative. Life is good! We are all so lucky to be alive and living in this wonderful, magical world. Some people think I’m naive but that’s not the case. I just recognize that I have it pretty good and try to act accordingly. I love bright colors (especially purple) and nice shoes. I don’t dwell too much on the past. Take a woman who walked into my office at the Purple Door Detective Agency today. Her name is Aine (pronounced Ann). She’s a banshee from Ireland looking for a man named O’Neill who she is supposed to serve – bringing him to the underworld or some such – when he dies. She’s so dark and threatening right away. There’s just no reason for it. As soon as I recognized her ‘talents’, I knew she was the right one to help me find the person who killed my partner, John. He and I were also lovers. His death hit me hard but did I let it get me down? Absolutely not! I plan to kill whoever murdered him and be at peace with it. Aine threatened me if I didn’t help her. Like anything she could do would matter to me. I’m a pretty powerful witch – not someone to be trifled with. But if I want her help, I’m going to have to help her find O’Neill. I’m not worried about that either. Things just seem to work out for me. Life’s not all rainbows and blue skies, but it’s not all dark clouds and black magic either. Sometimes when my reflection talks back to me in the mirror, I just ignore it and turn away. It’s good to be a witch! 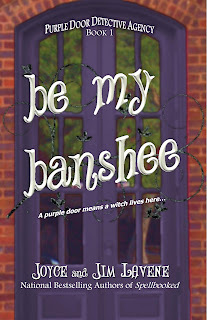 It's good to leave a comment since one person will receive a print copy of the first Purple Door Detective Agency mystery - Be My Banshee - complete with illustrations! Please leave your name and an email. We'll choose a winner by the end of the day. Sounds so intriguing even though I wonder if I am the target audience. A blogger recently called this book a paranormal cozy so I think you probably are the target audience, LD. Thanks for stopping by! Hi Sheila! Good to see you here! I can't wait to read this new series!! Love Joyce and Jim Lavene books!! Hi! Thanks Renae! We appreciate you stopping by! This is sure to be a fabulous book! I have read many of your books and would love to add this one. Hi Debby! Thanks for stopping by! This sounds very interesting! I can't wait to read it! I love all of your books and would love to add this book to my collection. It sounds like an interesting book. As someone who loves Red Hats. I wonder if a Purple Door Detective Agency would have anything red nearby. Hmm, Rachel. Let me think about that. Cozies are my favorite, add paranormal and I feel witchy and good to go! Me too ReaderWoman! We love the ghosts and the witches! Thanks you for entering the contest! Let's hear it for never ending book lists! Wouldn't it be awful if that wasn't the case? 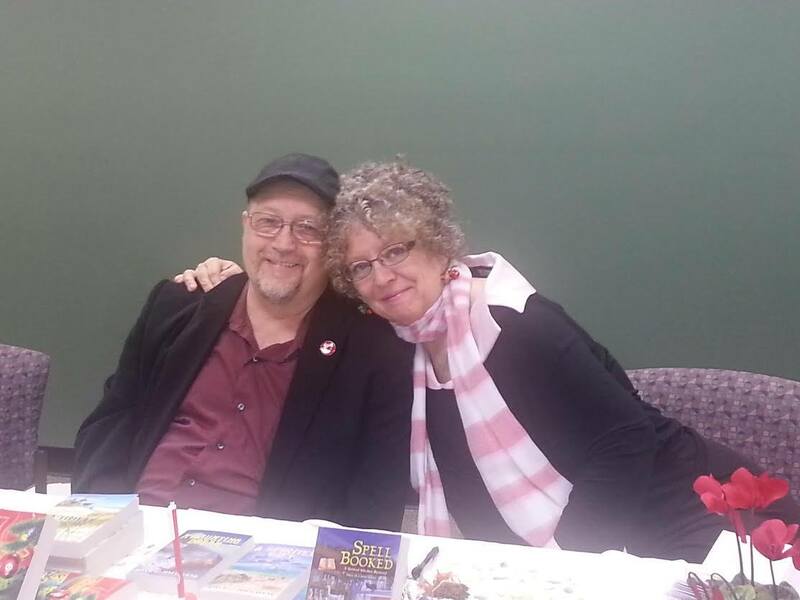 Love all of Joyce and Jim's books! Love that attitude, Pat! Every life does need magic! Sounds intriguing, a new series to check out! I love finding new authors😊. Me too, Heather. Especially if there are ghosts and witches in it! I agree with Sunshine. If someone killed someone I loved, I'd most definitely take out a contract on them, or do it myself if I knew exactly who they are. Having three older brothers (Army, Navy, Marines) I learned how to defend myself early on. I also have weapons training thanks to a cousin. So yeah, Sunshine rocks and I'd love to read her story. I feel certain Sunshine and crew are coming your way, Nora! I love that the witch's name is Sunshine since usually a witch is portrayed as dark and mean. I'm looking forward to a positive witch. Definitely not dark or mean, Sue. This looks like a great new series! I'd love to read this! Thanks for the chance! You're so welcome, Karen! We loved writing it! Your name is in the hat! This might be a little different read for me, but I think I'd like it! It's good to try new things, Judy! Oh my gosh, this sounds like my kinda book! I just love a good witch :) Can't wait to read it. And if I get lucky and win it, well it will be an added bonus since today is my birthday! Okay, here's my comment. Love your paranormals. Thanks Patg! we love you for loving them! I'll check my crystal ball, Cheryl! Thanks for being here, Kelly! Thanks for stopping by, petite! This looks like a great new series! I'd love to read this. Thanks for the giveaway. Thanks for coming out to play, Linda! I love your positive attitude, Sunshine, and your name. it will be nice to have another new series to read from these authors! Hi Janet! Thanks for your feedback! I'd love to have sprint copy. Hi Sandy! Have a great day! Thanks for coming by, Patricia! I would love a print copy. I can't wait to see the illustrations. Thank you for the chance! This book sounds great! Even if I don't win I am going to buy this book. Thanks for the chance to win! Another great series to read. This was a great post and thanks for the chance to win. I wish I were a witch. Very happy to read about it though. Fantastic thank you. Hi, you guys write awesome books and I love reading them all. I love paranormas, so I know this will be great. I would love a print copy and to see the illustrations,love your books!!! I love Purple and the whole concept of The Purple Door Detective Agency! Sounds like Aine and Sunshine are in for a very interesting scenario! Can't wait to read!! I'm probably too late, but I do love your books. Doward Wilson in my winner of Be My Banshee. Thanks for being here.